Belting out a song can be oh-so soul satisfying, stress busting and freakin’ good fun! In fact, two thumbs up on that proven notion from the 300 folks who gather twice weekly at the Clinton Tavern to get their song on at public sing-alongs organized by Choir! Choir! Choir!. 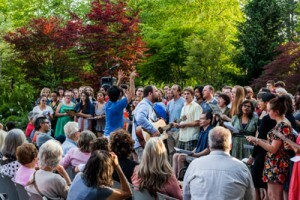 Launched by Daveed Goldman and Nobu Adilman in 2011, the public choir’s popularity spiked when a taping of its David Bowie tribute at the Art Gallery of Ontario went viral, leading to invites to participate in memorial performances for the pop icon at New York’s Carnegie Hall and Radio City Music Hall. A recent Prince tribute at Massey Hall was also a massive hit. In addition to organizing public pop-song events, C!C!C! (its short-form handle) can customize performances for private events plus facilitate corporate teambuilding sessions. “Music is common ground that people share,” notes Adilman. “A choir is symbolic for working and playing together in harmony,” adds Goldman. Dynamic keynote speakers, the pair tailors presentations to theme, integrating experience-based motivational messaging and song-filled audience interaction. Let us all sing and LOL!